Watch as a gigantic dorsal fin breaks across the surface of the water and then sweeps back into the waves with a resounding splash. You don’t necessarily need to experience the magic of nature through the eyes of National Geographic. You can do so right here in Bangladesh. While dolphins are abundant in the waters surrounding Khulna, whales are much harder to come across. A fishing village at the mouth of the river Poshur, called Dublar Char is the starting point of the quest to find the giants of the sea. About forty kilometers into the sea, it may be possible to spot whales. But the probability of spotting one is forecasted by monitoring the breeding patterns and movement of the water. Generally, it is during the winter, around December, when the sea is calm, that the whales can be spotted. 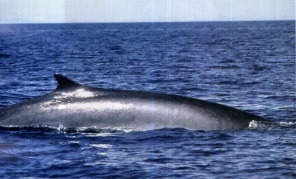 It is possible to observe to kinds of the species – the Bryd’s whale and the Fin whale, the latter being the second largest whale found on the planet and capable of growing up to eighty feet. They usually ply the under water canyons in the Bay of Bengal. Different species of dolphins are can also be found, among which the common bottle nose dolphin and the Spinner dolphin are easier to spot. The mammals are extremely friendly creatures, deriving joy out of swimming along with boats and racing each other. The experience will leave you simply awestruck. The Guide Tours Bangladesh has managed to make a name for them both at home and abroad. The people have learnt to look towards the Guide Tours for a quality, hassle free experience of the remote corners of the country. It’s renowned for arranging the best trips to the Sunderbans and has a fleet of four magnificent steamers that are engaged in river cruises and excursions to forests. Asides from trips to the Sunderbans, The Guide Tours also arranges forays to the St. Martins. It also maintains a picturesque resort in Bandarban. The Guide Tours also arranges for many day trips in and around the city, giving a whole new outlook tot the sights and sounds we take for granted. The one thing The Guide Tours preaches is eco-tourism. The tour operators are a stickler to anti-littering and conservation, which brings to light their ulterior motive – to give the most enchanting experience without harming the bounties of nature. It is characteristics such as high standards, reasonable prices, expert knowledge and the drive to preserve the environment that make the Guide Tours the best tour operators. Situated in the south of Bangladesh, amidst sprawling hills and serpentine rivers, Bandarban is home to several ethnic tribes. Chimbuk, the highest point in Bangladesh, is what makes Bandarban famous. But the best that Bandarban has to offer is an immersive experience with the local tribes. The main tourist spots are situated quite near the tribal villages. The Bhom Tribal village, or Farukh Para, is quite close to the scenic Shailapropat, while the Murong tribal village is close to the famed Chimbuk, but quite a ways from the main road. Hatibandha village, the dwellings of the Tripura tribe, is situated in a beautiful valley. A lot of the villages are accessible only by foot and Bandarban also offer some of the best hiking trails in the country, providing a scenic route. But it is necessary to be in good shape to enjoy the complete package. Sometimes it may be possible to get near a village on a jeep, but most are in a pitiful condition, and you have to be somewhat adventurous to get on one. When in a village, don’t feel awkward when the tribal children stand around in throngs, openly staring. They also want to see how other people live, just as you have gone to see how they live. It is possible to talk to them, some of them are fluent in Bangla, while other will go at length, gesticulating till their intentions are understood. They very friendly and hospitable, but the women tend to be reserved and shy. Some of the older generations are cautious of tourists, but they are the ones who can spin the most wonderful tales. It’s best to travel with a renowned tour operator, as their knowledge is far superior. Taking pictures without their consent is considered rude, as is littering their village. The tribals deserve equal respect. The tribal costume and jewellery are beautiful, and in this era of fusion and the ethnic touch, they are funky. But it’s not always possible to buy the silver jewellery, for the women design and make it themselves for their own adornment. But it is possible to buy the colorful cloth that they wear somewhat akin to wraparound skirts. Let their rich culture sink into you. Enjoy their simple life – it’ll help give you a new outlook to life. Habitat of the famed Royal Bengal tiger, the Sunderbans is the pride of Bangladesh. It’s the biggest unbroken system of mangrove forests in the world, and at the brink of the Bay of Bengal. Narrow creeks and shallow rivers criss-cross the virgin forests. It is the animal –lover’s paradise. An encounter with the Royal Bengal tiger might be imminent, but just in case luck doesn’t favor you, you won’t be disappointed with the sight of the droves of spotted deer that come to drink at the riverbank, or the multitudes of exotic birds that skim the treetops. You might even come across a pug print, embedded deep in the mud. A boat ride through one of the many estuaries will reveal the Gangetic dolphin, crocodiles and even jellyfish. You can come across literally thousands of tiny little crabs, tinged red as they scamper across the beaches. Wild boars run across open stretches of the river banks to hazard a foray into the river, while monkeys risk photographer’s lenses to swing from tree to tree. The Spotted deer, best known for its liquid eyes and white speckled hide, is bound to turn up, grazing by the river. A walk in the forest, through the muddy, mangrove spikes will unleash the best wild life encounters. The Ring Lizard, distinguished by its black and yellow markings can be seen on a branch basking in the sun’s rays filtering through the trees. Hoots from macaque groups echo through the forest. The Sunderbans is home to many endangered species, not counting the Royal Bengal Tiger itself., such as the Masked Finfoot, a rare bird with a conspicuous yellow beak. At night, layback on the ship’s deck and drink in the uninhibited sight of a starry night. Owing to it’s remote locality and safety concerns, it’s best to travel to the Sunderbans with a tour operator. Tucked away between vast expanses of tea estates, this is no ordinary tea stall. The concrete structure has seating arrangements for over twenty people. The locals know it simply as Romesh’s tea shop. The menu comprises of the usual genres of tea with milk, ginger tea. But it also includes a variety of tea that can only be described as cocktails. Shada (white) tea is one such unusual drink that comprises mostly of milk with a minute amount of tea in it, thereby giving it a white hue. There are also layered or colored teas, all of which are served in transparent glasses. But the most coveted delicacy of them all has to be the Paanch Ronger Cha (five colored tea), which comprises of five colors. This drink exudes mystery, from its appearance to its preparation. The proprietor, on taking a customer’s order, enters a dark room off the main sitting area and promptly shuts the door from prying eyes. A sign above it forbids curious patrons from entering the kitchen. All thoughts of suspicious ingredients and ill enchantments evaporate as soon as the proprietor emerges with the masterpiece – the five colored tea. The glass truly does hold a five hued drink, which upon drinking, manages to retain its different layers. Is it truly magic? Well, not quite. It’s basic chemistry actually. The lowest layer comprises of a very thick sugar solution, on top of which lies a less dense layer of condensed milk, which is preceded by a layer of tea mixed with milk, and so on. It’s very cleverly contrived and requires a great deal of skill, but it’s a delight for all. A glass of this fabulous 5 layered tea costs Tk. 50. Similar types of this drink are the two and three layered tea, which are made based on the same principles and come at a cheaper rate. Any Dhaka dweller will pounce at the chance to whine about the traffic on the roads, the jams and the long waits at the stoplights. Most, while completely engrossed in their complaints of losing precious time at these stoplights fail to notice that they can actually do a spot of shopping while they wait out the stop light. The past year has experienced a shift in the habits of the people on the streets – the former beggars who have now become enterprising enough to carry out thriving businesses. The best place to witness this phenomenon is at the Sonargaon crossing at Panthapath, where the traffic signals are infamous for their ultra long waits. Here, alongside the usual flowers and candy sold at traffic signals, one can now find the odd towel, decoration piece and even plastic containers, a list that keeps on boasting additions everyday. Recently the streets of Dhaka have been taken over by an army of vendors selling popcorn and pirated books. If you’re lucky enough, you might even come across a person selling CD’s and posters. Maps of all shapes and sizes, depicting our beloved country are in abundance as are the vendors wooing children with their varying collection of knick-knacks ranging from balloons and paper puppets to inferior quality Lego look-alikes. It’s possible to finish part of the weekly grocery shopping on the way to the supermarket of one’s choice. It’s also possible to while away the twenty plus minutes that it takes to travel the length of the road at rush hour, by reading a book just bought off the vendors while munching on hot, crunchy popcorn, washed down with a cold bottle of water – all of which are available literally within your arms reach. For those with a tight purse, you can always fall back on the age old pass time of window shopping, watching the vendors go by with their wares. Zara, Gap, H&M – you name it, Bongo’s got it! Bangabazar, more popularly known as Bongo by the youths and expatriates who frequent the market, is notorious for its shockingly cheap prices. All the latest trends in designer wear available under one roof and vowing to go easy on the wallet sounds too good to be true, but it is. A lot of the popular western brands are found in the market and they come in all shapes and sizes. These are usually rejects from the garments that manufacture the merchandise for top labels. But don’t be turned off by the word rejects – most of these ‘rejects’ are labeled so, because they may be missing a tag or something as inconspicuous as a lone, speck of thread peeking out of the collar. And while most of the stock doesn’t fall under the category of ‘rejects’ in our books, there are bound to be some sporting holes near the cuffs or missing a zip, so be sure to check carefully before purchasing. The narrow alleys and poor ventilation are bound arouse claustrophobia in the strongest of the lot, but what makes Bongo the best place to shop for western casuals are the bargains, which pretty much over rides all other obstacles. T- shirts can go as cheap as Tk.50, so putting Diesel on your back wont put a strain on your resources. If you have your bargaining skills down to pat, you can get the latest whitewashed jeans for as less as Tk. 200! Need more to convincing to make a trip to Bongo? Picture this scenario: you have fallen head over heels for a pair of jeans, but it’s not in the brand of your choice. Need a solution to the dilemma? Ask the shopkeeper to slap on a tag of your favorite brand. So you do have the power to customize your clothes. The best part about shopping in Bongo is that you can buy so much with so little! The much coveted traditional taant saris are a specialty of Belkuchi. 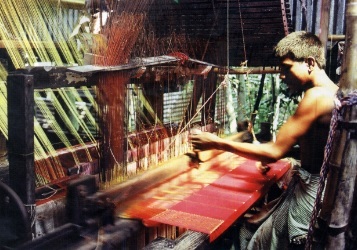 A major portion of the saris featured in top Dhaka stores originate from this region. Most of the industries here are small and are usually run from the owner’s homestead. Walk down any of the narrow, winding village alleys and you are bound to come across the sight of just dyed thread drying in the sun or the unified click-clacking sounds of a dozen looms, emanating from the many tin houses that seem to crop up in even the tiniest of places. The cotton saris that take shape from such looms are sheer works of art, and a rundown on the process of sari making will leave you with new levels of respect for the art. The proprietors are usually more than happy to show off their wares and you come across saris sporting fancy names like Devdas and Mayuri but all are true masterpieces. Most of the businesses stock up on a wide variety of designs and shades, ranging from the traditional to the funky. You can be sure to knock off a few hundred takas from the prices quoted in Dhaka city, and if you are adept in the intricate art of bargaining, then beware, you’ll be coming home with additional pieces you had no intention of buying. Prices start from Tk.500 upwards. These industries also make use of excess or wasted thread. These are cleverly spun into funky, striped, cotton saris, and are sold at an unbelievable price of Tk. 200! Not only are they creative, they are also efficient and environment friendly! Some of the industries in the area also manufacture lungis, so there really is something for everybody here. The first day of the Bengali New Year, Pahela Baishakh, is celebrated by the entire nation – age no bar, class and creed irrelevant. As the day dawns, the people greet the New Year with song and dance, and there are specifics such as the Ramna Batamul, fairs and parades that have come to be associated with Pahela Bashakh. The mood is festive as the entire community takes to the streets in celebration. Flowers and fairs, Panta and Ilish, Saris and Punjabis are all a big part of the age old tradition of celebrating the Bengali New Year. The best places to be on Pahela Baishakh are the parade in front of the Fine Arts Institute, Ramna Batamul and the fairs. The colorful, mask made by Charukala students are a perfect accessory. No other occasion brings in a multitude of color as this, and no other event makes the entire community as proud of its heritage and culture. Sun, sand and surf is synonymous with St. Martin’s Island. Walk down the white sandy beaches with the wind in your hair. Feel the salt spray in your face while the foamy waves gently lap at your feet. There’s nothing as breathtaking as the view of the deep, blue sea stretching out over the horizon. This scenario, although set as if for a romance novel, is actually best for the perfect game of beach volleyball. All the major hotels such as the Prashaad , have a volleyball net strung out on the beach, amidst the many hammocks that can be found in the shade of the numerous coconut trees. Ask the hotel management for a ball, or bring your own. Make a team, and you’ll be palying the best game of beach volley ball ever! It’s the setting that makes all the difference. Somehow the prospect of diving into the waves to fetch a stray serve is more stimulating than anything else. You can wallow in the beautiful sights or go for a quick dip in the sea. Nearly two hours by sea truck from Teknaf, St. Martins has the most beautiful beaches in the country. It has all the characteristics of the ‘remote’ island, complete with coconut trees and clear, blue water. Even your GP phone won’t have a network this far out. But it’s fast becoming industrialized and the beach front will soon join the concrete jungle that is now Cox’s Bazaar. So enjoy it before the tide turns. Colors are best distinguished against a dark background. Lights are best illuminated on a dark night. For a spectacular experience of a play of lights, travel to Jamuna Bridge any evening to see the wondrous melding of nature and man’s creation. The halogen lights lining both sides of the bridge take on an ethereal glow against the dark countryside that stretches towards the horizon only to be engulfed by the domineering river. Jamuna Bridge is the link to the north and is about three hours driving from Dhaka, depending on the traffic situation. While crossing the bridge itself will give you the perfect wind – in – your – face experience, you won’t be able to perceive the play of lights shimmering on the surface of the river. Its best to cross to the other side, grab a sumptuous meal at one of the many restaurants and rest houses that litter the area, and return to near the base of the bridge for a stunning but peaceful experience. Some of the areas are off limits, but some of the guesthouses have a beautiful view. Toll for crossing the bridge is Tk. 400 for a private car. The serenity of the sound of the river gently lapping against its banks coupled with the reflection of the halogen lights creating designs on the water is a great getaway from the mundane existence of everyday life.